So, last night, Sweet Pea, 2, chose the big pieces of my outfit for day three of our child stylists project. Her eyes got big and wide for this dress — “It has SO MANY circles, mommy!” And when she spied these patent green ballet flats, it was love at first sight. So with all that going on, I could hardly wait to see what other colors her brother would add to the mix. 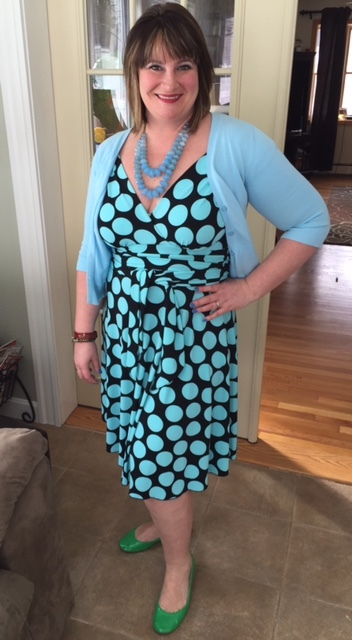 However, he’s a big fan of blue, so when he saw what she had chosen, he picked an aqua cardigan and this blue necklace to expand on the main palette. 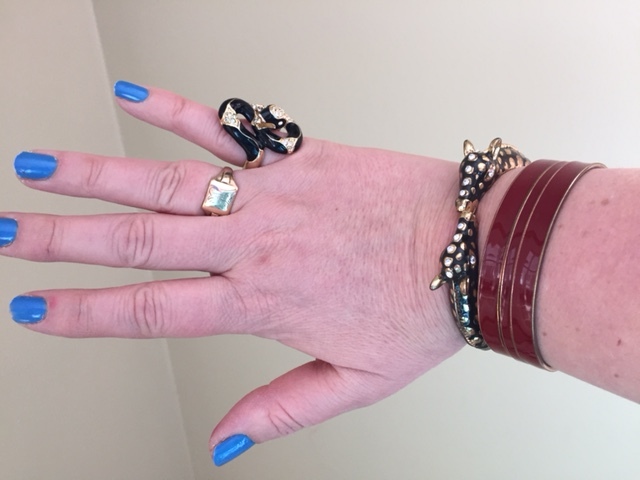 He did shake things up a little in the accessory department, pulling these red bangles, plus a giraffe bracelet and a snake ring from the jewelry annals of my jewelry armoire. Side note: The other gold ring I’m wearing I wear every day. It’s a ring my grandmother gave my grandfather in the 1920s. It used to have his initials on it, but they are mostly rubbed off. 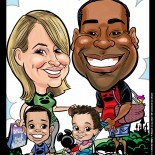 I miss my Grammy and Pop-Pop. Last, please excuse my nails. A hot mess I haven’t had time to deal with yet. I went to Target with both kids this morning wearing their handiwork, except I had to swap out the shoes for boots because, Boston winter. This was a much worse look with distressed brown motorcycle boots with buckles, also chosen by kids, but my husband wasn’t here to snap a pic of that part, so you’ll just have to picture that in your head. Thankfully, we only needed five things, so we were in and out of public quickly — or as quickly as you can escape Target with two kids picking out their own new toothbrushes and arguing over who gets to push the cart. See day one here of the project here, and day two here. This entry was posted on February 17, 2015 by Maisy Fernandez in Happiness, Parenting and tagged adventures in parenting, child stylists, children, creativity, fashion, kids, style.